"Montage––juxtaposing images by editing––is unique to film (and now video). During the 1920s, the pioneering Russian film directors and theorists Sergei Eisenstein and Dziga Vertov demonstrated the technical, aesthetic, and ideological potentials of montage. 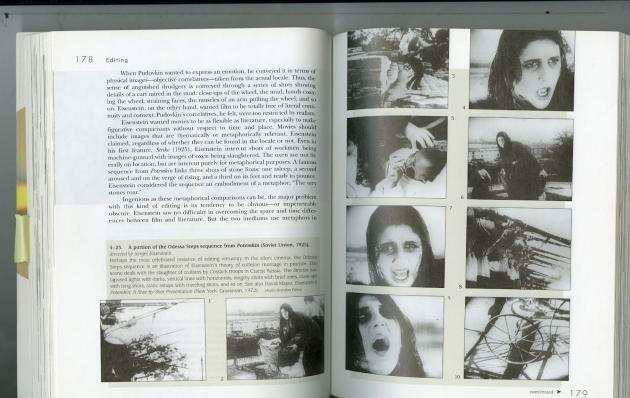 The 'new media' theorist Lev Manovich has pointed out how much these experiments of the 1920s underlie the aesthetics of contemporary video. Eisenstein believed that film montage could create ideas or have an impact beyond the individual images. Two or more images edited together create a 'tertium quid' (third thing) that makes the whole greater than the sum of its individual parts. 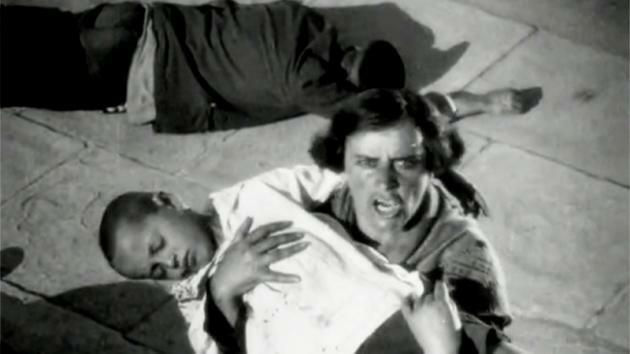 Eisenstein's greatest demonstration of the power of montage comes in the 'Odessa Steps' sequence of his 1925 film Battleship Potemkin. On the simplest level, montage allows Eisenstein to manipulate the audience's perception of time by stretching out the crowd's flight down the steps for seven minutes, several times longer than it would take in real time"
"Technique which demonstrates the inherent power of montage as a primary tool in the manipulation of the viewer's perception. According to Kuleshov, cinema consists of fragments and it is their combination rather than their content that is essential in evoking and triggering different emotions. 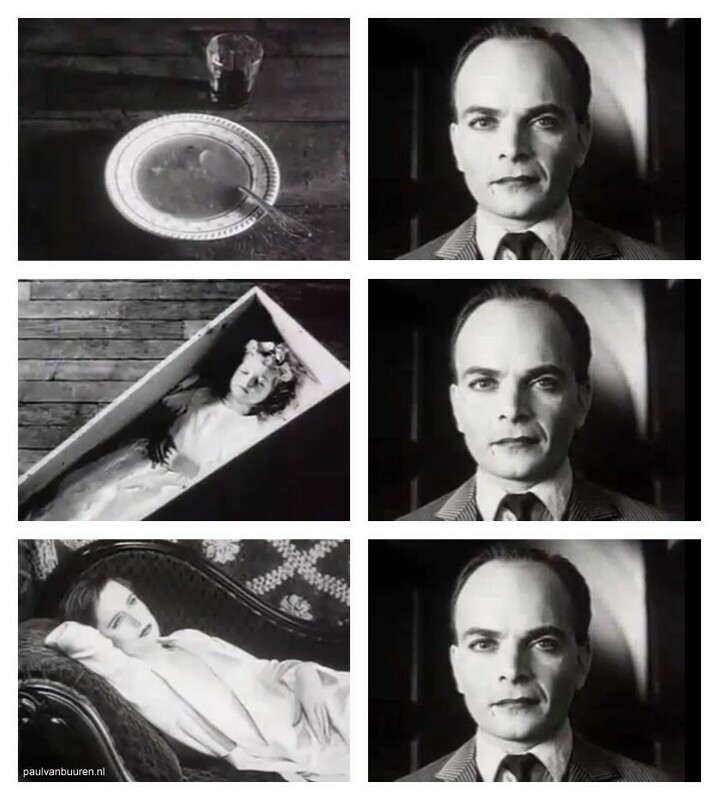 His original experiment consists of using the same shot of the character's face, frozen in a neutral emotion while editing it next to different objects he appears to be glancing at: a girl in a coffin, a bowl of soup, and a woman. The audience interpreted the three situations as expressions of sadness, hunger and lust." "Mise–en–scène refers to the visual design of a film. A narrative film's visual elements can include lighting, set décor, costume design, props, blocking, spatial relationships, scene composition – Mise–en–scène is how these visual elements work together to tell the story. 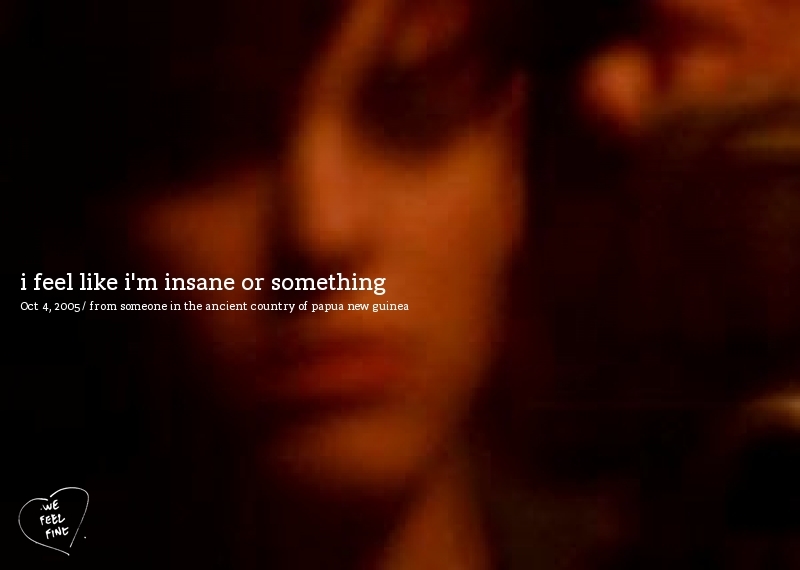 Every visual element designed for narrative film is considered mise–en–scène. Even non–narrative films, such as documentaries, can be said to have a certain degree of mise–en–scène. This arrangement and design expresses aspects of the characters, themes, and story that are necessarily in dialogue." Fig.1 James McTeigue (2006). "V for Vendetta"